Why, oh why didn't somebody think of this before? These simply genius gloves will make you want to turn off the dishwasher and wash all your dishes by hand. 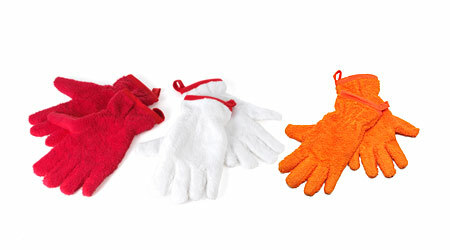 Made of absorbent terrycloth, these gloves will make drying the dishes a quick and simple experience. Not to mention, you will cut back on dropped dishes, there will be no more fingerprints on glasses, they are one size fits all and they have waterproof lining. We haven't been this excited since rubber dish gloves were invented. Available in red or white. As featured in O at Home.